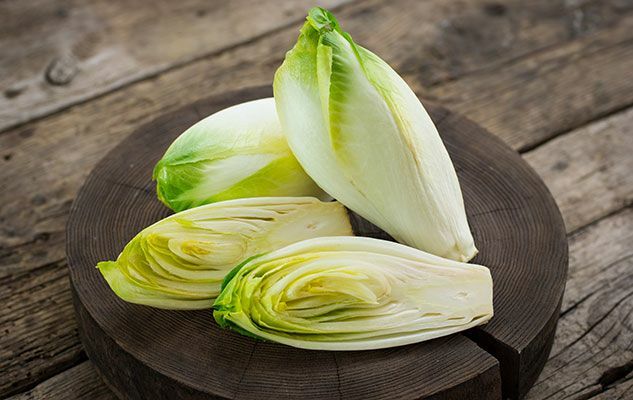 Belgian endive is in fact a type of chicory that was created by accident in Belgium in the 19th century, from wild chicory roots, which looked like elongated yellowish edible shoots. The Flemish call it «witloof» which means «white leaf» and it goes by the name of «chicon» in Walloon. Almost everywhere else, it is known as «Belgian endive». As a matter of fact, each year, Belgians consume on an average of eight and a half kilos per person! The advantage of producing a fresh vegetable during the winter season was such that endive cultivation spread rapidly to others countries in Europe. Although it was unknown in America for a long time, this vegetable is now cultivated here, especially in Quebec and in Ontario. Its production cycle is very interesting: The Belgian endive is sowed in the fields at springtime. Its roots are harvested in autumn and the leaves are thrown into the fields. The harvested roots are stored in large tanks at temperatures nearing freezing point, and in a dark shaded area, which will stimulate their metabolism. Following this, the roots are «forced», which means that they are transplanted into a warm area, away from sunlight, so that the Belgian endives may grow in 3 to 4 weeks. Absence of sunlight will prevent the small tightly wrapped leaves from turning green. When you buy a Belgian endive, choose a pale one whose leaves are creamy yellow and firmly wrapped. It can be kept in the refrigerator for a week. When you prepare this vegetable, we suggest that you remove the inner part of the stem, which is the most bitter. The Belgian endive is as delicious and refreshing in a salad as in an accompanying vegetable; it is not expensive and is easily available all year long. And the best part is that since it has very few calories, you can eat as much as you want. Originally published in the Journal de Montréal on October 25, 2008.